You may have noticed pictures like the ones above popping up at more and more places you visit. Hospitals began implementing no fragrance policies several years ago and schools as well as many government buildings are starting to follow suit. As research uncovers the health hazards of fragrances, awareness is also spreading about the impact fragrance sensitivities have on some people. 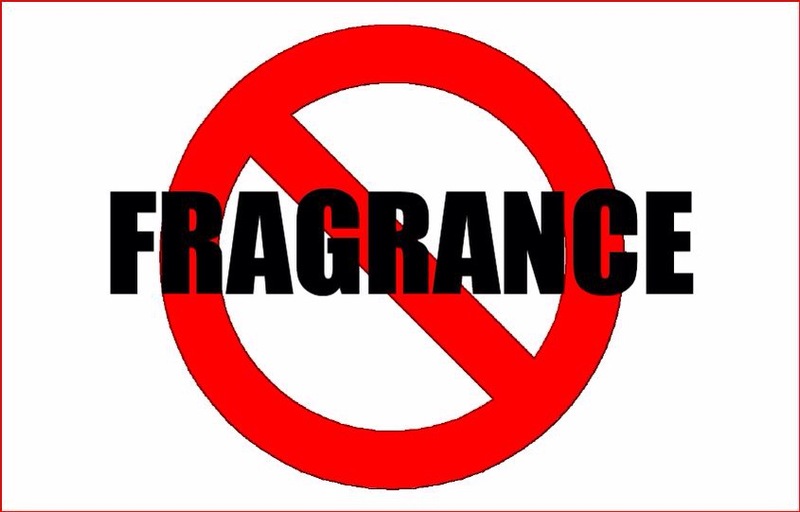 The symptoms of a fragrance sensitivity include headaches, migraines, dizziness, fatigue, shortness of breath, nausea, cold-like symptoms, and worsening asthma symptoms 1. If you suffer from migraines or chronic cold-like symptoms, it might be worthwhile to eliminate fragrances and scented products from your daily regimen and see if you notice a difference. Bear in mind that fragrances are not only in perfumes and colognes, they are in everything from bath and body products to laundry products and air fresheners. If you do have a fragrance sensitivity then you can encourage your employer to implement a no-fragrance policy using this guide provided by the Canadian Lung Association. Although the percentage of people who have a fragrance sensitivity may be small, scents and scented products pose a multitude of health risks to the rest of the population as well. According to the David Suzuki Foundation, “Fragrance recipes are considered trade secrets so manufacturers are not required to disclose fragrance chemicals in the list of ingredients.” Most of these chemicals have not undergone testing to determine whether or not they are hazardous to your health. One group of chemicals that are commonly used in fragrances are phthalates. Phthalates have no odour themselves but instead their purpose is to enhance the odour of other chemicals 2. They have been linked to obesity3, early puberty4, reproductive failure5, and the onset as well as worsening of asthma in children6. With everyone from Justin Bieber to Jennifer Aniston launching their own signature scents, it’s hard not to fall for the genius marketing behind fragrances. When you feel tempted to spritz yourself with another chemical concoction, just remember that smelling good does not require dousing yourself in harmful chemicals. For most people, simply showering and wearing deodorant as well as clean clothing is sufficient. One of my biggest pet peeves is people who don’t take regular showers or wash their clothes, and then practically bathe in fragrance to unsuccessfully cover up their bad hygiene. Perfumes don’t cover up bad smells. They just intensify the nasal assault. If you absolutely cannot resist wearing perfume or cologne, try limiting it’s use to special occasions only, and definitely do not wear it around pregnant women or kids. The health risks of fragrances far outweigh the benefits of wearing them. Smelling like synthetically made roses is not a good enough reason to potentially give your kids asthma or set them up for endocrine issues. 5. Romani F, Tropea A, Scarinci E, Federico A, Dello Russo C, Lisi L, Catino S, Lanzone A, Apa R. Endocrine disruptors and human reproductive failure: the in vitro effect of phthalates on human luteal cells. Journal Fertil Steril. 2014 Jul 10. pii: S0015-0282(14)00504-4. doi: 10.1016/j.fertnstert.2014.05.041. 6. Whyatt RM, Perzonowski MS, Just AG, Donahue KM, Calafat AM, Hoepner LA, Perera FP, Miller RL. Asthma in Inner-City Children at 5-11 Years of Age and Prenayal Exposure to Phthalates: The Columbia Center for Children’s Environmental Health Cohort. Environ Health Perspect. 2014 Sept 17.